The provincial capital of the Algarve, Faro, is a modern, lively city with attractive shopping precincts, good restaurants and a frenetic nightlife. It makes the city an exciting holiday destination in its own right, as well as a useful regional transport hub. 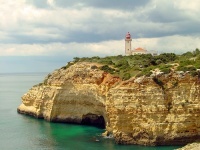 Thousands of travellers pass through Faro en route to the popular resorts of the Algarve. Those who choose to linger will find a town full of charm and the feel of a true Portuguese fishing port. There are some sightseeing opportunities while on holiday in Faro, mostly centred on the Old Town (Cidade Velha), which is entered through an 18th-century gate and enclosed by the remnants of medieval walls. Faro's most famous attraction is a macabre one, the Igreja do Carmo, which features a chapel whose walls are decorated with the bones of more than 1,200 monks disinterred from the neighbouring cemetery. Another worthwhile attraction near the city is the Ria Formosa Natural Park, and a short distance to the north is the peaceful village of Estoi, boasting a pink Roccoco palace and Roman ruins dating from the 1st century. To enjoy the beach while on holiday in Faro one has to travel a few miles; a long sandy spit lies across a bridge near the International Airport. It is a clean stretch of golden sand where umbrellas and sun beds can be hired and all sorts of watersports enjoyed. Being a university city, Faro has a large student population with an energetic nightlife; in fact, those in search of a peaceful holiday retreat may find the vibrant atmopshere a bit of a drawback. But those seeking a party won't be disappointed. It all happens along the Rua do Prior and in the narrow alleys off Rua Conselheiro Bivar and Rua Infante Dom Henrique.